In addition to constructing the Farley Train Hall, the Governor announced the joint venture will create 112,000 square feet of retail and nearly 588,000 square feet of office space within the Farley Building. Preconstruction work will begin this fall, with the new Train Hall expected to be completed by December 2020. The Governor also announced that the MTA will at the same time initiate the comprehensive redesign of the LIRR’s existing 33rd Street concourse at Penn Station and an extensive renovation to the adjacent Seventh and Eighth Avenue subway stations. Construction on the LIRR concourse and the subway stations will conclude by or before completion of the work on the Farley Train Hall. The redesign will include nearly tripling the width of the existing corridor, which will significantly decrease congestion and result in notably higher ceilings – providing bright lighting, new way-finding, ticketing and informational systems. 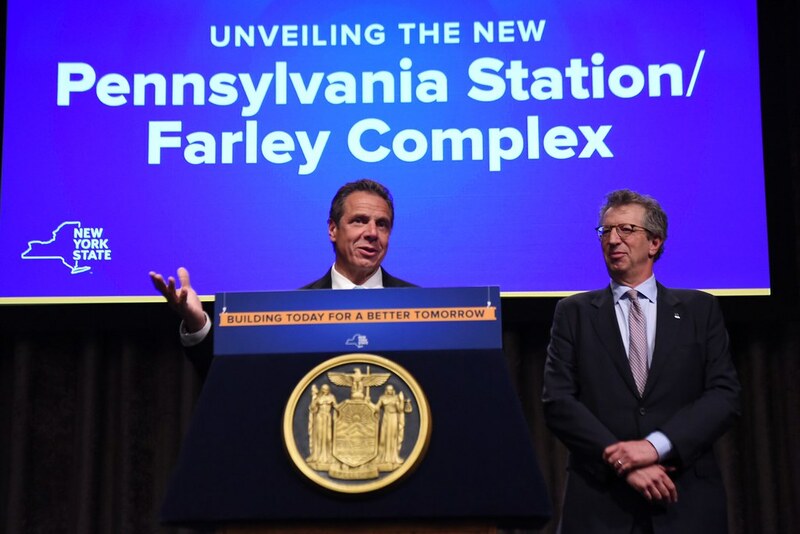 View the Governor's presentation unveiling the new Pennsylvania Station-Farley Complex here. In January, Empire State Development, the MTA, LIRR and Amtrak issued an RFP soliciting proposals for the comprehensive redevelopment of the historic Farley Building, including a Train Hall and the surrounding office and retail space. RFP responses were received in April and reviewed by a panel of private and public experts from the real estate, construction, design and finance fields. Related, Vornado, and Skanska have all provided guarantees to complete the $1.595 billion project on time and, as part of the agreement, will pay the state a total of approximately $600 million in recognition to the value of the development opportunity within the Farley Building. The remainder of the project will be supported by $570 million from Empire State Development and $425 million from a combination of Amtrak, LIRR, Port Authority and federal government sources. The Moynihan Train Hall will include shops and restaurants located under a new skylight on the building’s historic and architecturally dramatic steel trusses. The building will increase floor space 50 percent from Penn Station, and service riders on the LIRR, Amtrak and eventually accommodate passengers from Metro-North. A total of nine platforms and 17 tracks will be accessible from the Train Hall. The project will use union labor and has committed to fully meet the Governor’s nation-leading goal of 30 percent of the work completed by Minority and Women-Owned Business Enterprises. This is not a plan – this is what’s going to happen. People are going to walk through this station and recognize that this is New York. A dramatic redesign of the LIRR portions of Penn Station will significantly improve passenger experience and circulation. The plan will include nearly tripling the width of the 33rd Street Corridor, which is among the busiest sections of Penn Station and stretches along the station’s lower level from Seventh to Eighth Avenue. Other improvements will include upgraded lighting and wayfinding, and digital screens to convey information and create a modern passenger experience. It is anticipated that the majority of the corridor improvements will be completed simultaneous to the Train Hall’s opening, with other elements completed sooner. Construction of the new LIRR corridor will cost an estimated $170 million. The MTA will issue an RFP for the preliminary design of Penn Station improvements to pre-qualified consulting firms today. A contract is expected to be awarded by the end of 2016. The transformational redesign also includes upgrading the two subway stations at Penn Station. Many of these improvements to subway stations on Seventh and Eighth Avenues are expected as early as 2018 and will cost approximately $50 million. The first phase of construction, to create a concourse west of Eighth Avenue, is nearing completion. The concourse will provide direct access to LIRR and Amtrak tracks and will connect the future Moynihan Train Hall to Penn Station underground via 33rd Street. New plazas and street level entrances into the Farley Building on either side of the monumental staircase will provide access to this new, lower concourse as well as speed boarding and exiting for passengers. In January, Empire State Development, Amtrak, and the MTA issued a Request for Expressions of Interest for redeveloping Penn Station. As Amtrak relocates to the Moynihan Train Hall, the RFEI responses provided ideas for the future proposed redevelopment of the current Amtrak concourse that will be incorporated into concepts previously suggested by the railway operators. ESD will partner with Amtrak on the creation of an RFP for the concourse. Ultimately, all of these coordinated efforts will result in a bolder, fully modernized Penn-Farley Complex, with increased passenger capacity, inviting entrances and access points, and a state-of-the-art Train Hall at the Farley Building across Eighth Avenue. All work will be compatible with future plans to add platform and track capacity to Penn Station in conjunction with the completion of the Gateway Program. Congressman José E. Serrano said, “This important effort will expand New Yorkers’ access to state of the art, safe, and reliable transportation. Renovating the Moynihan Train Hall, the LIRR Concourse, and the Amtrak Portion of Penn Station will modernize a key part of New York’s public transportation. The Moynihan Train Hall project had been on hold for many years and I am glad to see Governor Cuomo taking the necessary steps to move it forward,” said Congressman Serrano.